This summer, a Company of Fools will be taking over Hintonburg Park for the tenth anniversary of their summer Torchlight Shakespeare series with their production of Shakespeare’s The Merry Wives of Windsor, directed by Hintonburg’s own Catriona Leger. “Downton Abbey meets Bugs Bunny, and they all get together and eat some jellybeans,” are the words Leger uses to describe her latest work with the Fools. 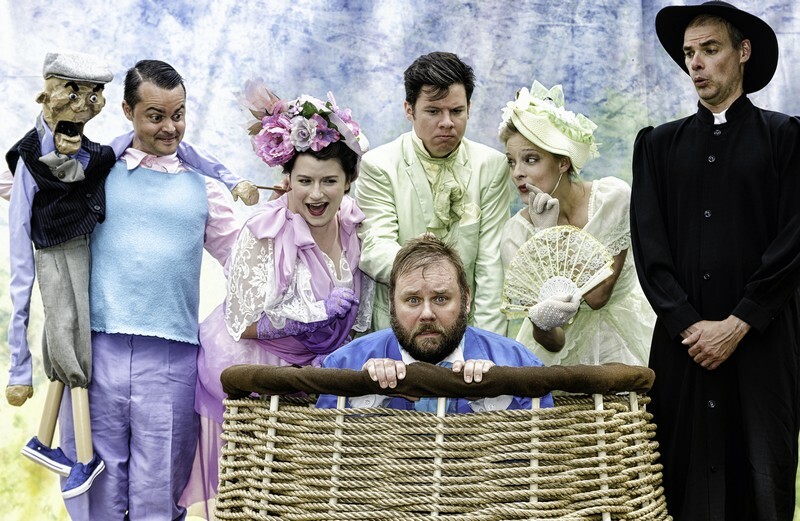 The Merry Wives of Windsor is a classic comedy that tells the story of Shakespeare’s rouge, Falstaff, a con man with a penchant for drink and women and his failed attempts to woo two married women. Leger’s interpretation brings the story to England’s Edwardian period, a period where women are just starting to find freedom. This is exemplified as we see the merry wives use and abuse Falstaff for their own amusement. Everything is presented with a heavy dose of saturated colour from the costumes and backdrop. The constant challenge facing a Company of Fools production is putting together an entire cast of characters with only six actors. In this production 19 characters are split between the crew. “It’s a challenge that I embrace,” says Leger. One of the actors in this summer’s production is John Doucet, also of Hintonburg. Doucet has three roles in the Merry Wives: Parson Hugh Evans, Mistress Quickly and the host of the Garter Inn. “Catriona has been very good about making sure that we stay within her rules and we’ve been very good about making sure we push her boundaries,” says Doucet. For added chaos, the play’s final scene requires all characters to be on stage at once. One of Leger’s clever solutions has been to replace actors with puppets, incorporating a ventriloquist style into the production. “One of the things I love about the Fools, is they take these big plays and they figure out how to do them with only six people. To me that’s exciting theatre,” says Doucet. Company of Fools received a special honor earlier this month, when Mayor Watson declared July 3 Company of Fools Day in Ottawa. The performances start at 7 p.m. and run for 90 minutes. The show is free, but donations are greatly appreciated as the support keeps local theatre alive. Look for Doucet again this September as Company of Fools continues the adventures of Falstaff in Margo MacDonald’s adaptation of Henry IV, Hal & Falstaff.